Contrary to the claims of police, two Commissioners of the National Human Rights Commission (NHRC) have found that the recently slain Lahu activist made his living from selling coffee beans not illicit drugs. On 25 March 2017, Angkhana Neelapaijit and Tuenjai Deetes of the NHRC visited the house  of Chaiyapoom Pasae of the Lahu ethnic minority who was summarily killed by soldiers on 17 March on suspicion of selling drugs. 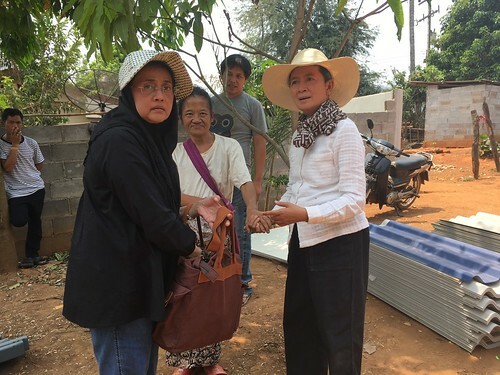 Tuenjai said the NHRC found that most of Chaiyapoom’s income came from selling coffee beans, adding that his bank account shows that his regular financial transactions involved on average less than 10,000 baht, which is not out of the ordinary. Tuenjai said further that for the last five years Chaiyapoom had been active in promoting the rights of his Lahu community and other ethnic minorities in the region. Tuenjai urged the police to reveal evidence supporting their claim that the late activist was a drug dealer. Pol Lt Gen Poolsap Prasertsak, Region 5 Police Commissioner, recently stated that the authorities have solid evidence to prove that Chaiyapoom was an active drug dealer in Chiang Mai. This allegedly includes the bank statement of the slain activist and findings of an undercover police officer. The police, however, did not disclose details. According to an army report, on 17 March Chaiyapoom tried to escape custody after soldiers arrested him and Pongsanai Saengtala, 19, the driver of a car in which authorities allegedly found 2,800 methamphetamine pills. After the young activist hid in a nearby bush and attempted to throw a grenade at the soldiers who followed him, one of the soldiers shot him dead with a single shot in self-defence, alleged Col Winthai Suvaree, spokesperson of the National Council for Peace and Order (NCPO). But in an interview that Thai PBS broadcast on 21 March 2017 , an anonymous source said that Chaiyapoom was dragged out of the car and beaten by soldiers before he was killed near a checkpoint in Chiang Dao District of Chiang Mai. Chaiyapoom was a well-known activist from the Young Seedlings Network Camp in Chiang Dao District. He was involved in numerous campaigns to promote the rights of ethnic Lahu and other vulnerable ethnic minorities in northern Thailand to gain citizenship, health care, and access to education. He also spoke out against abuses by the Thai security forces against his community during anti-drug operations.